On 3rd September 2013 Savas Michael-Matsas a Greek Jewish Marxist intellectual and General Secretary of the Workers’ Revolutionary Party (EEK) of Greece and Kostas Moutzouris, the former dean of the National Technical University of Athens, are judged in a trial. They are accused of “defamation” against the Greek openly Nazi party, the infamous “Golden Dawn”, for “instigation of violence and chaos” and “disruption of the civil peace” because, four years ago, in May 2009, the EEK has issued a leaflet calling for participation into an antifascist demonstration of protest against a murderous attack by the Nazis against the immigrant communities in Athens covered by the Greek police. During 2009 a lot of groups, among them EEK, resisted against the pogroms of Greek police in the area of Agios Panteleimonas in Athens, a neighborhood that Golden Dawn has been attacking on immigrants in the last years. EEK, among other political groups, was calling in the demonstrations by leaflets and posts in its newspaper and website. This is the crime that Savvas Michael-Matsas is accused of. In addition, the Dean of the National Technical University of Athens Konstantinos Moutzouris is accused of allowing the alternative web site Athens Indymedia to broadcast from buildings of Technical University’s campus. This is the other crime that Konstantinos Mounztouris is accused of. The two people are judged after members of Golden Dawn had posed a lawsuit against the whole Greek left parties, coalitions, groups and independent personalities in 2009. The lawsuit was not acted until late 2012 that from many people that have been accused in 2009 only the two people were called in a trial on 3rd September 2013. We are expressing our solidarity to Savas Michael-Matsas and Kostas Moutzouris and all the people who fight against the barbarian capitalist regime and the nazis! We demand all the charges against them to be dropped now! US workers in the fast-food industry staged a one-day strike in dozens of cities on Thursday, calling for better wages and the right to unionise. The strike was the largest so far in a 10-month campaign that began with 200 workers striking in New York last November, and which spread to Detroit and Chicago in July. Organisers said the strikes, scheduled a day after the 50th anniversary of the March on Washington and a few days before Labor Day, were being held in 60 cities and had spread to the south – including Tampa and Raleigh – and the west, with workers in Los Angeles and San Francisco taking part. In New York, the Democratic mayoral hopeful Christine Quinn took part in a march with several hundred workers and protesters before entering aMcDonald’s near the Empire State Building on Thursday morning. Local organisers in Detroit said at least three stores had been shut down because of the strikes. One was a Checkers restaurant; the other two were Church’s chicken restaurants. The striking workers are part of a coalition of unions, campaign groups, clergy and community members. Fast-food workers are expected to be joined in some places by retail employees at stores owned by Macy’s, Sears and Dollar Tree. They want to form unions in order to negotiate higher wages without fear of recrimination. They are demanding $15 an hour, up from $7.25, the current minimum wage. The strikes come as the White House, members of Congress and some economists have called for an increase to $9 an hour. “We don’t have a voice,” said Wise, who is paid $9.25 an hour at Burger King and $7.40 at Pizza Hut. The median wage for front-line fast-food workers, who are typically non-unionised, is $8.94 per hour, according to the National Employment Law Project, an advocacy group for lower-wage workers. Fast Food Forward said workers were still being targeted for organising, including having jobs terminated and hours reduced. The National Retail Federation (NRF) dismissed the strike as “theatre orchestrated by organised labor”. McDonald’s and Burger King said they did not set wage rates at the franchises that operate most of their outlets in the US. McDonald’s said in a statement that in its wholly-owned restaurants, pay starts at minimum wage but the range goes higher, depending on the employee’s position and experience level. It said that raising entry-level wages would mean higher overall costs, which could result in higher prices on menus. “That would potentially have a negative impact on employment and business growth in our restaurants, as well as value for our customers,” the company said. On 24th August we oppose to bedroom tax across the whole of the UK! On 24th August the people across the whole of the UK, in more than 60 cities, show their resistance to the bedroom tax. Bedroom tax is another austerity measure which hits the poor and economically weak workers and unemployed in the British society. We invite people to join these demonstration in their cities and resist against the austerity policies that Cameron’s government, following the guidelines of the EU, implements. The next point is the 29th September that we will demonstrate against the destruction of NHS in Manchester in Torry party conference. In Bristol we gather at 19.00 in College Green. The office of the deputy minister for public broadcasting will cost the taxpayer €451,250 a year, according to a decision signed by Prime Minister Antonis Samaras. The minister, Pantelis Kapsis, was appointed in the June government reshuffle to the post, in order to oversee the winding down of the state broadcaster ERT and its replacement by a new station. In a decision published in the government gazette (FEK B 1994/2013) on August 14, Kapsis’ office will receive €225,625 from the state budget for 2013 and €451,250 from 2014. The decision was signed on 12 August by Samaras and the alternate finance minister, Christos Staikouras. The order allows Kapsis to hire 20 employees to his office: ten on temporary contracts, five as special advisers, and the remainder seconded from the civil service, which the government and troika have repeatedly maligned as “bloated”. However, after the details of the decision were reported in the media on Thursday, Kapsis issued a statement claiming that the staffing numbers are standard for all ministers and deputy ministers. He said he would not be hiring 20 staff. “These hirings have not taken place and will not take place. Apart from four secretaries, my office employs five special advisers,” he said. Last month, Foreign Minister Evangelos Venizelos awarded himself a second office and twenty additional staff, in order to fulfil his role as deputy prime minister, at a cost of €468,706 a year to the taxpayer. Calls have been made for an overhaul of the long-hours culture among young staff working for banks in the City of London after the death of a “dedicated” German student who had won a sought-after placement at Bank of America Merrill Lynch. Moritz Erhardt, 21, had won a place as a summer intern at the London city offices of the US bank and was nearing the end of his placement when he was found dead in the shower at his temporary accommodation in east London by ambulance services on 15 August. Merrill Lynch did not comment on the length of Erhardt’s working hours, and also declined to comment on whether interns – who are understood to be paid £45,000 pro rata – are routinely made to work longer than 12-hour days. An inquest is yet to be opened and it is understood that a pathologist is undertaking a toxicology examination before filing a report as to the possible cause of death. Scotland Yard said they were not treating the death as suspicious. It is believed that representatives from Merrill Lynch have been in touch with Erhardt’s parents, who are from Staufen im Breisgau in south-west Germany. In a statement, the bank said Erhardt was “popular among his peers and was a highly diligent intern at our company with a promising future”. Chris Roebuck, a visiting professor of leadership at Cass business school who has held senior HR roles at international banks, told the Financial Times that the overworking of junior employees was an increasing problem in the City. “For reasons related to an individual’s ambition or the current employment market, people are pretty desperate to get jobs,” he said. A source from the organisation FinanceInterns, which gives advice to students and graduates entering the industry, described the average workload as slavish and said the organisation would be pushing for an independent body “to give a voice to the young people in the finance industry” and ensure that such punishing practices stopped. A spokesperson from the organisation said that applicants were highly unlikely to make it through to the final round but that once selected for an internship horror stories about working practices within the industry were unlikely to put them off. “Once a student has come to us, they’ve already made up their mind they want to work in banking so the horror stories… [don’t] put them off. The spokesperson added that while the rewards for interns were dazzling and included personal American town cars and expenses paid excursions to nightclubs it was ultimately a facade. The spokesperson added that a culture extreme working hours was mainly restricted to a select number of finance division such as mergers and acquisitions but said that “it’s even more competitive than it’s ever been”. John McIvor at Merrill Lynch said he would not comment on the hours interns worked. “We take on interns through the summer, the principle reason is – we believe – a great opportunity for the interns to get to know us as an organisation better and for us to get to know the interns as well,” he said. “It’s a very important part of our recruitment programme. So a lot of the people we will ultimately recruit as junior bankers … will come from the summer intern programme … It’s better than conducting face-to-face interviews. He added that interns were given plenty of support including mentors, a line manager and a full HR team “to take care of any concerns”. Save our NHS! 29th September in Manchester! 19-year-old jumps to death to avoid trolley bus fine in Greece. A young man died after jumping off an Athens trolley bus to avoid paying a fine for not having a valid ticket. A 19-year-old man has succumbed to his injuries after jumping off a trolley bus to avoid a ticket fine in the western Athenian suburb of Peristeri. The young man did not have a valid ticket and attempted to exit the vehicle to avoid paying a fine but was seriously injured from the fall because the bus was in motion. He was rushed to the Agia Olga hospital and subsequently to the Geniko Kratiko hospital in Nikaia, where he passed away in the early hours of Wednesday. The bus driver and the ticket inspector have been detained by police, while an investigation is underway to determine the circumstances under which the young man managed to open the door while the trolley bus was in motion. The Egyptian Health Ministry said Thursday that at least 525 people were killed and more than 3,700 injured in Cairo and other cities and towns in Wednesday’s violence. CAIRO — Egyptian authorities today significantly raised the death toll from clashes the previous day between police and supporters of the ousted Islamist president, saying more than 500 people died and laying bare the extent of the violence that swept much of the country and prompted the government to declare a nationwide state of emergency and a night-time curfew. The death toll, which stood at 525, according to the latest Health Ministry figures, makes Wednesday by far the deadliest day since the 2011 popular uprising that toppled long-time ruler and autocrat Hosni Mubarak — a grim milestone that does not bode well for the future of a nation roiled in turmoil and divisions for the past 2½ years. Health Ministry spokesman Khaled el-Khateeb put the number of the injured on Wednesday at 3,717. Near the site of one of the smashed encampments of ousted President Mohammed Morsi’s supporters in the eastern Nasr City suburb, an Associated Press reporter today saw dozens of blood soaked bodies stored inside a mosque. The bodies were wrapped in sheets and still unclaimed by families. Relatives at the scene were uncovering the faces in an attempt to identify their loved ones. Many complained that authorities were preventing them from obtaining permits to bury them. El-Khateeb said 202 of the 525 were killed in the Nasr City protest camp, but it was not immediately clear whether the bodies at the mosque were included in that figure. Wednesday’s violence started with riot police raiding and clearing out the two camps, sparking clashes there and elsewhere in the Egyptian capital and other cities. At least 525 civilians were killed nationwide, many of them in the crackdown on the protest sites. Forty-three members of Egypt’s police force were among those killed, the ministry said. Thousands of Morsi’s supporters had been camped at two major sites in Cairo since before he was toppled by the army on July 3, and had vowed not leave the streets until he was returned to power. The death toll continues to rise, with Morsi’s Muslim Brotherhood saying the actual number of dead is more than 2,000. Police are reported to have arrested key Brotherhood leaders. There have been calls for pro-Morsi supporters to head back out onto the streets of Cairo, despite an overnight curfew. Armoured bulldozers moved into the two protest camps in Cairo shortly after dawn on Wednesday morning, firing bird shots and tear gas. Snipers fired on the square from surrounding buildings while helicopters hovered overhead and armoured bulldozers ploughed over the protesters’ makeshift defences. Masked police tore down tents and set them ablaze. “They smashed through our walls. Police and soldiers, they fired tear gas at children,” said Saleh Abdulaziz, 39, a secondary school teacher clutching a bleeding wound on his head. Police took full control of the Rabaa al-Adawiya camp by Wednesday afternoon, according to the state news agency. Al Jazeera’s Jane Ferguson, said smaller groups had been congregating in squares and streets after the protest camp was cleared out. “Just because they’re leaving Rabaa Square doesn’t mean that they’re leaving protests altogether,” she said. Al Jazeera’s Omar Al saleh takes a look at some of the scenarios. Violence spread beyond Cairo, with deadly clashes in the cities of Alexandria, Fayoum and Suez.Earlier on Wednesday, security forces took control of Nahda Square, the smaller of the two sit-ins, using tear gas and bird shots. Two journalists were killed during the violence. Mick Deane, a cameraman for the UK-based Sky News channel, and Habiba Abd Elaziz, a reporter for the UAE-based Xpress newspaper, died from bullet wounds. ON August 10th detained migrants in Amigdaleza near Athens protested in an uprising against the extension of their detention from 12 to 18 months. 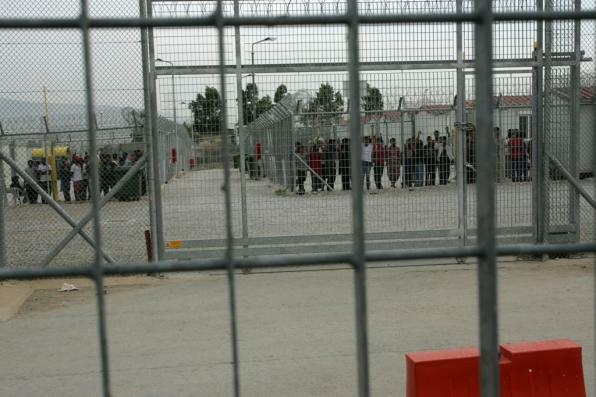 1.620 migrants are currently detained in this prison while it was built only for 820. In the past months different human rights organisations had reported about the inhuman detention conditions, about cases of police violence and forced “voluntary returns”. Saturday 10th of August: Immigrants imprisoned at Amygdaleza detention center (near Athens) started a revolt around 21.00 o’clock. They protested against the deplorable conditions and the extension of their detention from 12 to 18 months. Many of the detainees face deportation following the negative decisions on their asylum cases and have lost hope. 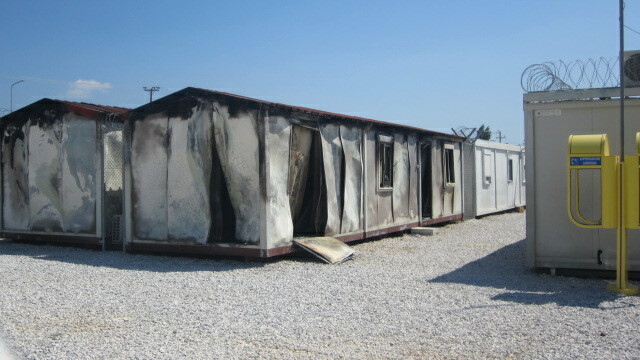 They set on fire mattresses and the cargo containers that are being used as their cells. 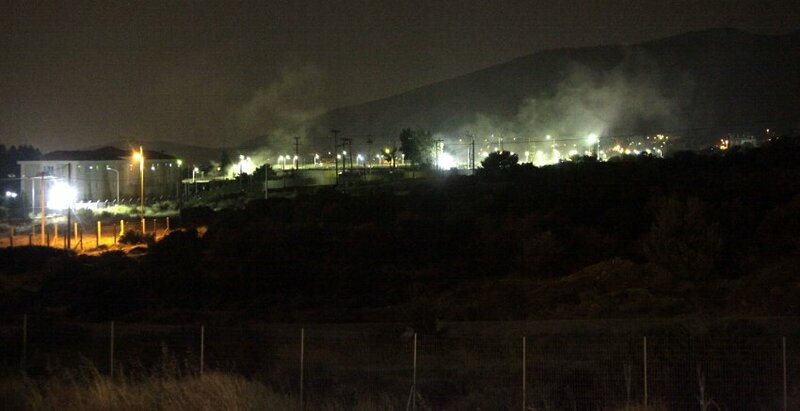 Riot police entered the detention center by force and fire brigades arrived to take control of the fire. The riot police made extensive use of tear gas and flash grenades. There are many injured migrants, some heavily injured. The police also claimed that ten of their staff are injured after having stones thrown at them. Today 41 immigrants are facing various charges after the suppression of the Amygdaleza uprising. They come from Pakistan, Afghanistan, Bangladesh and Morocco. The situation of the immigrants injured during the uprising is yet unknown, since access to the detention center is denied even to lawyers. “Amigdaleza and the other detention centers for migrants are a huge business with a direct contracts to certain suppliers… they found a machinery and pull out european funds… what migrants and what security of citizens? For 1.600 detainees in Amigdaleza the EU pays each day 120.000 Euro!!! If the money that commes from outside would go to the detained migrants they would have even swimmming pools… but they live in containers under 45 degrees celsius… we just found another patent to “build our villas”. Electricity had been cut for three days so migrants could not turn on the air condition. Leftist rights group KEERFA reported that electricity had been cut “because migrants turned on air condition” while mainstream media report that it had been cut due to construction works. 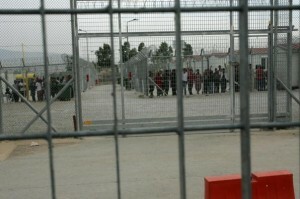 The detainees denied returning into the dark and hot container cells. Police guards reacted with insults and beatings. As KEERDA reported then some officers stepped consciously on the meals and said: “We don’t care if you die!” and protests began. Nearly a month and a half has passed since the fall of Mohamed Morsi and the Muslim Brotherhood from power, thanks to the action of the masses who did not feel any difference between the policies of the Brotherhood and those of Mubarak. Both opposed the masses and their demands for bread, freedom and social justice. Despite the downfall of Mubarak, Tantawi and Morsi in successive revolutionary waves beginning on 25 January and finishing on 30 June, Minister of Defence General Abd-al-Fattah al-Sisi, President Adli Mansour and Prime Minister Hazem Beblawi have not learnt their lesson. Instead, they divert the masses and make the “war on terrorism” a pretext for dropping demands for social justice during the transitional period. Striking workers have been in the front ranks of the struggle by the masses since the strike in Mahalla in 2006. It was they who threw down Mubarak, and after him Tantawi and Morsi who saw during his period in office the largest proportion of workers’ strikes to demand their rights. Yet the new government of Mansour and Beblawi is dealing with strikers with the same repressive policies, and today arrested two of the leaders of the Suez Steel workers’ strike (Amr Yusif and Abd-al-Ra’uf, with the knowledge of the police, while the armed forces surrounded the factory. The origins of the dispute go back to the signing of a collective agreement between the company and the workforce in February 2012, in the wake of workers’ protests. The agreement included provisions to pay workers a profit-sharing bonus, and agreed a pay structure, health care and bonuses. The dispute is about the implementation of a number of provisions in the agreement, most importantly the profit-sharing bonus, as the owner claims that the company is making a loss and that he owes money to a number of banks. When the workers asked at a Ramadan breakfast recently for other bonus payments in place of the profit-sharing bonus, he just kept on talking about his losses. The workers countered by saying that the company has increased its factories to four units, and that it also donated 3 million Egyptian pounds towards paying off the Egyptian national debt. Workers were surprised when, the following day, 12 of their colleagues had been dismissed. After that, discussion and negotiation took another form, and the workers presented their demands in full, but management refused to answer any of them, saying they must get back to work and then negotiations could begin. The workers refused, and continued their strike for the second day, when the police arrested two of the workers and the army surrounded the factory. The recent rise in workers’ strikes and protests shows that the Egyptian revolution is not over yet, and that the struggle of the working class will continue until the revolution’s demands are met. The organisations signing this statement confirm their support for all workers’ strikes, and their adoption of workers’ legitimate demands. We call on workers’ organisations, political groups and trade union leaders in other workplaces to show solidarity with their colleagues at Suez Steel and to confront the regime’s attacks on workers, which will move tomorrow to Tenth of Ramadan, Alexandria and Port Sa’id. We also condemn the siege of the workers’ sit-in at the factory, and the arrest of strikers, and demand that Minister of Labour Kamal Abu Aita swiftly deals with the situation. We demand the immediate release of the arrested workers, the army’s withdrawal from the factory and that workers’ demands are met. Rush messages of protest to General Abd-al-Fattah al-Sisi, Commander in Chief of the Egyptian Armed Forces, demanding the immediate release of the two arrested workers. Email General al-Sisi here mod@afmic.gov.eg copy in Kamal Abu Aita, Minister of Labour (minoffice@mome.gov.eg) and the Egyptian Ambassador to the UK (eg.emb_london@mfa.gov.eg) or your country. The aim of the blog is to give information about the situation in this globalised world. Each article expresses the ideas of the respective authors and is not necessarily representative of Real Democracy Bristol.